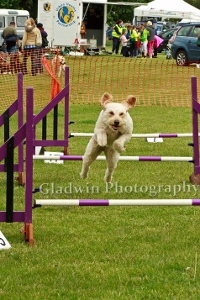 The Fun Dog Show was very popular as always, with the emphasis on fun, take a look at the photos, they tell a lovely story! All of our dog show entrants were of course fantastic – making it such a hard job for our judges. The Dorset Dog of the Year 2013 was Belle, a gorgeous rescue dog who is now being trained as an mental health assistance dog. The show was compered by Paul from the Urban Heaths Partnership and run by Purbeck Agility, who also put on some smashing displays of ‘dancing with your dog’. 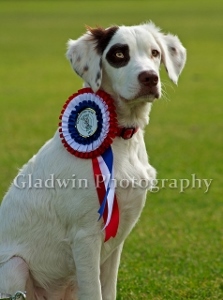 As well as her trophy, Belle won a year’s magazine subscription thanks to ‘Your Dog’ magazine and a professional photo portrait thanks to Gladwin Photography. 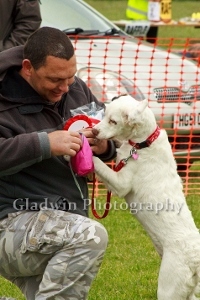 Natterjacks Vet very kindly sponsored all the rosettes and the trophy so many thanks to Andy at Natterjacks! There were also prizes for 1st, 2nd and 3rd places and everyone who entered also went away with one of our sought-after Dorset Dogs key rings. A very special thanks to the trainers who put on the wonderful demos and taster sessions in the 3 rings: Purbeck Agility, Tricks4Treats and Purbeck Gundogs. They make the Festival extra special! 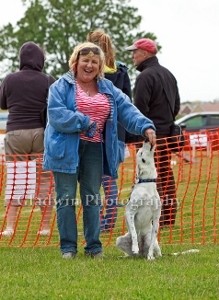 Thanks also to Zoe from Gladwin Photography who took such fantastic, high-quality photos, revealing the high spirits of the Festival and the bond between people and their dogs. Alison – Reiki, Ashley Heath RSPCA, Pure Chaos2Calm, Dan’s Pop-up Cafe run by Michelle, Diamond Face Painters, Dogs Trust Salisbury, Dorset Dog Delights (no relation! ), Dorset Dog Rescue (ditto! ), Dorset Dogs Togs (ditto again! ), Forever, Friends of the Strays of Greece, Guide Dogs for the Blind, Herbal Hounds, John & Marie, Julie’s Jewellery, Kingsbere Kitchen, Labrador Rescue, Margaret Green Animal Rescue, the National Trust, Paws4aTreat, Calli’s Corner Pet Pawprints, Pet Portraits (Natalie), Planet Paws, Police Dog Handlers, Purbeck Agility, Purbeck Gundogs, Redhill Common Conservation Volunteers, Stour Valley Supporters, Ricki’s Ices, Roger from the County Council’s Dorset Countryside team, Tricks4Treats, the Urban Heaths Partnership staff who also did a fabulous job of stewarding – and scoobying! and the World Wildlife Fund. Although they couldn’t come, raffle prizes were also kindly donated by the Worldwide Veterinary Service, Hengistbury Head land train, Natterjacks Vets, Five ways Pet Store, the Cinnamon Trust, Award Pet Supplies, Wallisdown Pets Corner, the National Trust and the Hiker Cafe (Hengistbury Head). Commiserations to Wessex Assisting Dogs who had awful last-minute transport problems on the day but we know you were with us in spirit and had put so much hard work into getting ready to do a demonstration for us, can’t wait to see you next year! A big thanks too to the lovely St John’s Ambulance volunteers who came along to look after us all on the day and to the helpful Bournemouth Parks staff. Can’t wait ’til next year’s Fest!